Here is an all-American cake that is easy enough for youngsters to make—and, it’s even a way to get them to eat fruits and vegetables! Preheat the oven to 350 degrees. Line the bottom of two 9-inch cake pans with parchment and butter the sides of the pans. To make the cake, sift together into a large bowl the dry ingredients—namely, the flour, baking powder, baking soda, cinnamon, and salt. 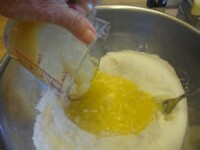 Make a well in the center of the batter with a wooden spoon. Into the well put the sugar, applesauce, and eggs. Beat the eggs together roughly with the wooden spoon until you can’t see yellow from white; then mix well with the other ingredients. 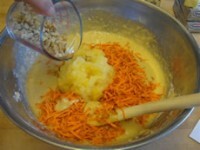 In to the center of this mixture put the carrots, pineapple, and walnuts and mix again. Pour this batter in to the prepared pans and bake in the center of the preheated oven, until the tops of the cakes are firm and the cakes have pulled away from the sides of the pan, about 30 minutes. Note: if using a convection oven, you need to turn down the heat and reduce the cooking time. Remove from the oven and let rest 10 minutes before turning out onto racks to cool. 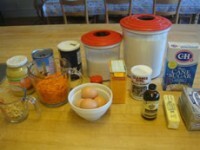 To make the frosting, with an electric mixer beat the butter, cream cheese, and vanilla until light and fluffy. Slowly add the confectioners sugar. Scrape down the edges of the bowl and mix briefly again. To frost the cake, turn one layer baked side down onto a serving platter. 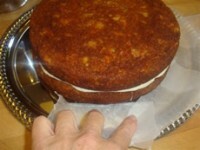 Spread with the cream cheese frosting, and cover with the other layer with the baked side up. Slip little pieces of wax paper under the edges of the cake to keep the plate clean. 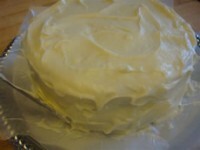 Spread the remailing frosting generously over the sides and top of the cake. 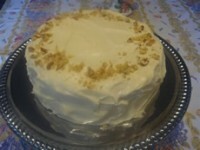 Decorate the top with additional chopped walnuts. Gently, slide out the strips sideways from the plate and chill the cake to set.